How to Become a Sheriff? Sheriffs are mostly elected through general elections, though the hiring process varies according to state. Moreover, they work on a county level and are in-charge of the entire county – as opposed to a single precinct. As a career, sheriffs and deputy sheriffs have a bright outlook, owing to the consistent need for law enforcement personnel. To become one, you will need to follow a series of steps, which involve fulfilling education requirements, completing a police training academy, getting the relevant experience, considering higher education such as a master’s degree in criminal justice and getting elected as the sheriff. In some cases, sheriffs might even have duties additional to normal law enforcement procedures, such as helping in court activities and working in jails. Their duties can be very similar to those of high ranking police officers, such as police chiefs, since they are responsible for their entire county, just like police chiefs are responsible for their entire departments. According to data taken from O*NET OnLine, a US Department of Labor service, Sheriffs and Deputy Sheriffs earned a median salary of $61,050 in 2017 with projected job openings between 2016 and 2026 at 49,500. Even though there is a continuous demand for law enforcement personnel, the employment demand for sheriffs will be largely based on the security needs of the relevant county. Local budgets allocated to the sheriff’s office will also have an impact on the salary, growth and demand for the position in specific counties. Applicants who have college degrees in law enforcement related subjects, such as a bachelor’s degree in criminal justice, or prior military experience might be able to get the best job opportunities. Before you begin the application process to become a sheriff, it is important to ensure you meet the minimum qualifications criteria. Applicants must be mentally and emotionally capable of being in a leadership position and should be able to respond calmly to high pressure situations. Physical fitness is also a requirement since the job can be very demanding. Applicants should have clean criminal record and strong communication skills. The minimum educational requirement to become a sheriff includes a high school diploma or a GED. Some localities may require a two-year long associate degree in criminal justice or a similar field. Since sheriffs are elected, a college degree is not an official requirement. However, aspiring sheriffs who have a degree in criminal justice or any other law enforcement related subject might have a competitive advantage over their peers. To be eligible for the position of a sheriff, candidates must first become sworn police officers by getting admission into and successfully completing a police academy. This training program typically lasts around 3 to 6 months and contains multiple theoretical and practical exercises. You will receive extensive training in subject areas such as crime scene management, firearm training and physical training, among others. Becoming a sheriff would require you to work your way up. A lot of the time, sworn police officers get promoted to deputy sheriff, before eventually getting to the sheriff’s position. You might need at least three to five years of experience in law enforcement before you can go on to become a sheriff. Even though this is not an official requirement, having a higher education degree might be helpful in the longer run. Since you would be heading an entire department, taking care of the whole county, you will need more expertise than a sworn police officer. A master’s degree in criminal justice or a related subject might be the advanced credentials that come in handy. For this step, you will need to do some prior research to check which departments are hiring. You will be conducting a campaign and various fundraising activities as part of your bid to get elected to the position of a sheriff. You will either be elected or appointed to the position, depending on the local law. However, most sheriffs are elected to their positions. 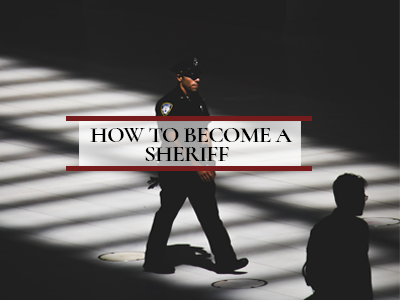 Once elected to the position of a sheriff, you might have to fulfill certain on-the-job training requirements, depending on the county you have been elected to. For instance, new sheriffs in Oklahoma are required to pass a compulsory training session at the sheriffs’ administrative school. The training requirements need to be cleared within the first year of appointment. To help you get into the work mode, there is a popular one-week long program called the National Sheriff’s Institute. This is designed to teach newly appointed members about training personnel and leadership styles.